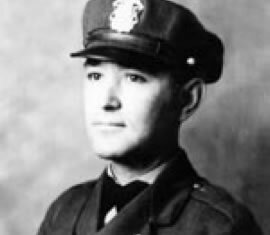 Trooper Van Wagenen is the first Utah Highway Patrol trooper to lose his life in the line of duty. The 42-year-old victim was following up on a report of a prison escape when he stopped at the Lake View beet slicing plant on Geneva Road in Provo. Trooper Van Wagenen warned the owners about the possibility of the escapees attempting to seek employment or stealing a vehicle. As he was turning to leave, Trooper Van Wagenen slipped and fell into a saw blade. Rushed to the hospital, the married father of five sons died a short time later of blood loss. He is buried in Provo City Cemetery. His bronze name plaque is sponsored by the Utah Highway Patrol Association. George Edwin Van Wagenen was my paternal grandfather. My mother, Warda was his daughter from his first marriage to Hazel Hansen. They divorced and he later married Johanna Scott with whom he had five sons.